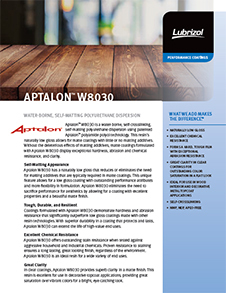 Aptalon™ W8030 by Lubrizol is a water-borne self-matting, self-crosslinking polyurethane dispersion. It has been designed using patented polyamide polyol technology and has a naturally low gloss that allows for the reduction or elimination of matting additives that are typically required in low gloss coatings. It provides excellent hydrolysis resistance, hardness, and chemical resistance. 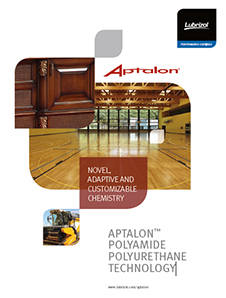 Aptalon™ W8030 is NMP-, NEP-, APEO-free and meets performance properties of many 2K solvent-borne finishes without the need for external cross-linkers. It is suitable for use in wood interior applications requiring high performance properties in a matte finish, decorative topcoat applications needing a flat look while maintaining color saturation. It has a shelf life of one year.